Lately, the news has been immersed in images of the city of Houston, Texas swallowed by a torrent of flood water. We’ve felt sympathy for those affected, we’ve worried about their welfare. We hope it will never happen, but sometimes it does. Fire, flood, earthquake, severe storm, car accident—sometimes disasters do happen. To make matters worse, an unexpected catastrophe can make already difficult situations even more alarming. When life is already complicated because a person you love cannot speak vocally, it can be even more difficult to cope when events explode into a state of emergency. 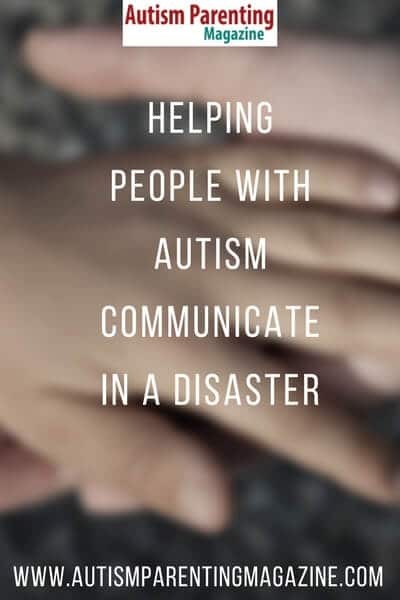 For anyone who struggles to speak, like those who use augmentative and alternative communication (AAC), an emergency preparedness plan must include a focused strategy for communication. Thinking ahead and being prepared for those worrisome ‘just in case’ situations could keep a disaster from turning into a terrible tragedy. Does my struggling communicator have a basic understanding of what to do in an emergency? This is especially important if for some reason his/her communication partner is hurt, lost, or unable to help. Does he/she know who to trust, where to go, or what to say to get help? Does he/she have a way to express needs and concerns until someone who better understands him/her needs can be located? A family who understands unique personal language is nice, but knowing how to simply communicate ‘yes’ and ‘no’ may be life-saving if no family member is around. If he/she uses AAC, does my communicator have access to vocabulary which will allow him/her to communicate clearly about the emergency? Can he/she tell someone what happened, how he/she feels, or where he/she is hurt? With the help of AAC users and first responders, Temple University created a list of the words most needed during an emergency. That list includes words like: blanket, broken, emergency, blood, family, home, hospital, flood, fire, earthquake, rescue, danger, and worried. Some AAC devices offer a built-in emergency board which includes words from this list like this board from CoughDrop. These boards give communicators the words they need to get the right help. What if we can’t charge our AAC speech device or what if it is damaged during the disaster? Having a physical copy of a basic communication board in your car or emergency kit is an important key to emergency communication. Some AAC boards, like those in CoughDrop, can be printed for this purpose by anyone, or you can print and preserve an emergency board like the one created by Temple University. It is also a good idea to keep a USB battery pack available in case of disaster. If the power is out, a communication device will quickly lose its juice and an emergency power source will keep the device talking. What if my communicator is separated from me and he/she needs to find me? Does your communicator know his/her address, your phone number, or how to get home alone if needed? Is that information saved in his/her speech device, backpack, or jacket so he/she could access it if needed? Accidents and disasters often have unexpected results and a communicator who is confused, injured, or afraid may end up running away or being separated from safety. It may be scary to consider, but it’s better to be prepared for the worst and then hope that never happens. Be sure the person has his/her communication tools available at all times. Find a way to gather basic information in order to best help those with limited speech. Provide access to a power source to keep the persons communication device functioning. People who struggle to speak may also struggle to understand—be patient and allow the time needed for clear communication to take place. No one wants disasters to happen, but when they do, it is better to be able to lean on the plans that have already been put in place than to sit back and hope that everything turns out right. Melissa DeMoux is the mother of six very lively children. She has worked with verbal and nonverbal students as a volunteer in children’s classes in schools and in the community for several years. Her niece uses AAC in order to speak, so Melissa is also an ardent proponent of augmentative communication.